BORN IN TANGIER, MOROCCO, Muhammad ibn Abdullah ibn Battuta was a famous Arab traveler and writer who explored in Africa, Europe, and Asia. Ibn Battuta’s journey began in North Africa in 1325 with travels that included visits to EGYPT, SYRIA, Mecca on the Arabian Peninsula, northeastern IRAN, southern IRAQ, the RED SEA, YEMEN, East Africa, Asia Minor, AFGHANISTAN, INDIA, Bengal, INDONESIA, CHINA, and SPAIN; his travels ended in 1353 after a journey across the SAHARA and Western Africa. The main motive behind the Moroccan traveler, like other Muslims of his time, was to perform the ceremony of hajj or pilgrimage of the holy places of Mecca in western Arabia or in what is now SAUDI ARABIA. He left Morocco, he tells us, “swayed by an overmastering impulse within me and a desire long-cherished in my bosom to visit these illustrious sanctuaries.” For most of his travels, Ibn Battuta was either returning to Mecca or journeying away from the holy city. During his adventures, he spent months of study in DAMASCUS, Syria, and sought employment and generous rewards in government offices in the Sultanate of Delhi in India under an Islamic kingdom of Turkic origin. As a devoted Sufi inclined in the mystical and ecstatic dimension of Islam, mostly popular in North Africa in the 14th century, Ibn Battuta stayed with other Sufi devotees and frequented places where saintly masters resided, seeking to gain divine grace or baraka under their guidance for a personal communion with God. He also traveled for the sake of curiosity and adventure to some unknown places in the Islamic world, or dar al-Islam. Describing his final travels, Ibn Battuta’s rare accounts of East African city-states and the Mali Empire in the 14th century have long been important to historians. Ibn Battuta came from a family of jurists and judges, with his ethnic ancestors from rural Berbers of northern Morocco. As a legal scholar, he was educated in Islamic sacred law (Sharia) and well versed in classical Arabic writing and poetry. Based on his travels in Asia Minor, India and western Africa, he expanded the genre of travel writing recorded in the book Rihla, or Book of Travels, published in 1357. 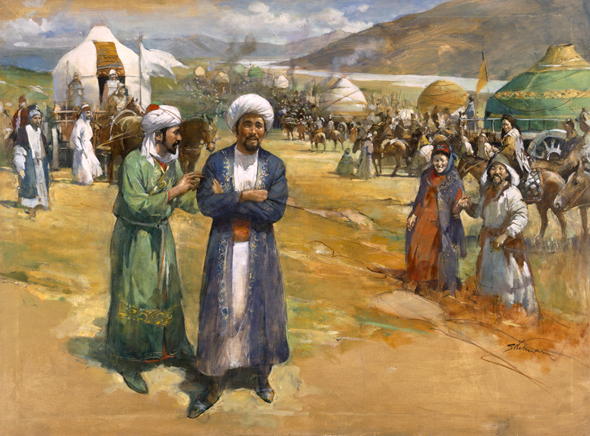 Although Muslim writers and travelers from northwestern Africa produced descriptions of the places they traveled to while making the pilgrimage, Ibn Battuta further developed the genre of travel writing by making it more of a detailed account of the traveled lands and encountered people rather than a mere extension of religious preoccupation. The Rihla is mainly significant in its descriptions of the Turkish chiefdoms of Asia Minor, India, and East Africa. It offers the most comprehensive and detailed depiction of the Islamic world after the disintegration of the Muslim empire in 1258 and the Mongol dominance of the Eurasian landmass in the 14th century.